Thank You, Volunteers, Partners and Sponsors! More than 4,900 volunteers removed over 21,000 pounds of litter and marine debris from the coast for the annual SOLVE Spring Oregon Beach Cleanup, presented by AAA, which took place Saturday, March 23 at 45 cleanup locations from Astoria to Brookings. 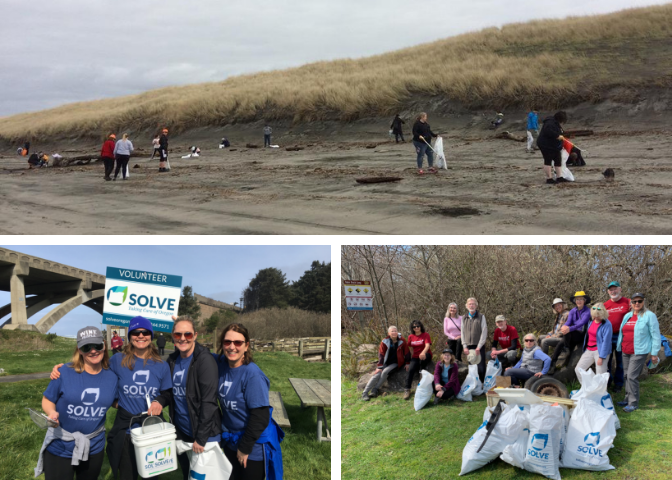 SOLVE has been organizing bi-annual cleanups along the entire Oregon coast since 1986. Since that time over 260,000 SOLVE volunteers have removed an estimated 3.6 million pounds of debris from the coastline. SOLVE’s annual Spring Oregon Beach Cleanup, presented by AAA Oregon, happens to come right as Oregon Governor Kate Brown declared March “SOLVE Month." Common items found during the event were tiny bits of plastic, cigarette butts, bottle caps, and food wrappers, which can be harmful to both marine life and shorebirds. Unique items found by volunteers included a kiddie pool from Rockaway Beach, a small dock filled with Styrofoam near Nehalem, multiple life vests and a rusty box spring. In addition to litter on the beach, some of the debris removed today had washed in from the ocean following winter storms and tides. Items ranged from fishing rope, crab traps, crates, and buoys to glass and plastic bottles. There were many inspiring stories from across the coast. In order to divert some of the marine debris from the landfill, SOLVE partnered with the Washed Ashore Project in Bandon. Artists will wash the debris and turn it into educational art sculptures. In Gold Beach, a taco truck provided tacos for the dozens of volunteers there following the cleanup. Many volunteers brought their own buckets and reusable gloves to the cleanup reducing the number of bags and vinyl gloves that were distributed.